Jessica Dupont is passionate about hockey. Really passionate. That’s quite evident from the manner in which she can talk about everything from the ‘Broad Street Bullies,’ those famous Philadelphia Flyers teams that won Stanley Cups a decade before she was born, to the Vegas Golden Knights, the NHL’s latest expansion team, but not, she believes, its last, due to the sport’s ever-rising popularity. 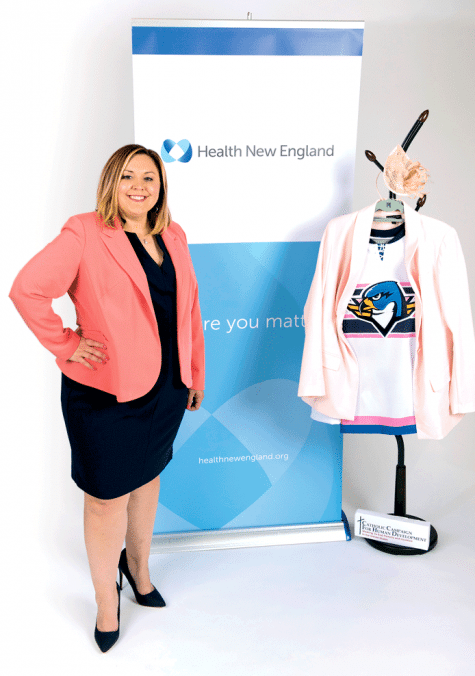 Dupont, the highest scorer among the 150-plus nominees for the 40 Under Forty class of 2017, is also passionate about giving back to the community, which she does through involvement with organizations ranging from Dress for Success Western Mass. to Square One. So she was really enjoying herself last month at a unique fund-raiser for Dress for Success called Hockey in Heels, undertaken in conjunction with the Springfield Thunderbirds. The event was staged this year just prior to the March 11 tilt against the Hartford Wolf Pack. Dupont is quite passionate about something else, too. That would be health insurance (a most unlikely career choice for this sociology major from Mount Holyoke College) and the broad goal of making sure those who have it understand it and get the most out of that critical benefit. Slicing through all that, she said her work involves making sure health insurance works for all the parties involved — HNE, those who provide the care, and, especially, those receiving the care. And she finds that work, and the company’s “holistic approach,” rewarding.